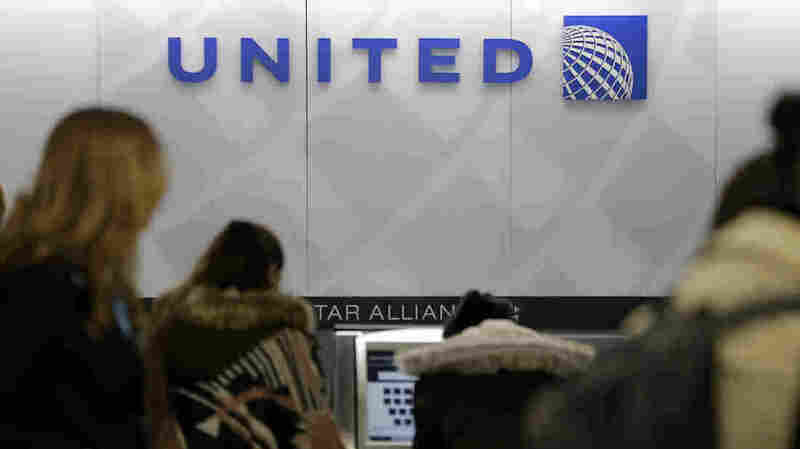 Rival Airlines Pounce On United's Bad Press : The Two-Way United Airlines has a PR disaster on its hands after a passenger was violently removed from a flight to make room for crew. For other airlines, it's a PR opportunity. After a passenger was dragged off a full flight on Sunday, United has had to do damage control, to the delight of some competitors. As United Airlines continues to grapple with a long-haul public relations disaster, rival airlines are pouncing on the opportunity to poke fun and promote themselves. United has been roundly lambasted after a passenger was violently removed from a flight to make room for a crew member. The airline's initial response was widely seen as inadequate, and in recent days United has been trying to apologize. Meanwhile, rival airlines have hastened to mock United and snag a little good PR for themselves — especially Middle Eastern airlines. The major Middle Eastern airlines have a longstanding, bitter rivalry with U.S. carriers, which accuse them of having an unfair advantage in competition for international passengers. In fact, United CEO Oscar Munoz's comments about that issue — accusing the Middle Eastern competition of being "branding" for their home countries, instead of a real airline — appear in a new ad spot by Emirates. Meanwhile, users on Twitter say some flight attendants for other U.S. airlines have been riffing on the controversy. Attendant on my Southwest flight tells passengers: "We're going to need four passengers ... just kidding." But we should note that an official-looking "Southwest: We beat the competition. Not you" image was not produced or endorsed by Southwest, the company said on Twitter.